I almost lost it at Mass today. It's true. I had to leave. I had to walk out the big doors and pray while rocking Patrick and shushing him and trying not to go back inside to announce "Mass is going on right now! Could everyone please be quiet!" I was praying and praying and praying while we were inside and hoping that no blood vestals exploded in my head, but the pressure was building and building and then I decided that in order to "avoid the near occasion of sin" I needed to take Patrick and step outside lest I said something that I regretted. Oh my... It was just... Wow. Let me try to put into words what happened. Mass got off to a rocking start. I mean that literally. When I saw the electric guitar come out to accompany the acoustic guitar I thought to myself "is it Sunday night?" and then gave myself a talking to about how we've been to a lot of Masses and there are much worse things than praise and worship music that makes me feel like I'm back in the evangelical Christian coffee house my friends and I used to go to in high school. These priests are solid. The liturgy itself will be flawless. There will be no ad libbing. Take a deep breath. Chill. I bounced Patrick up and down and mentally willed him to sleep. And he looked me in the eyes, smiled and (in his little wordless baby way) said "absolutely not." When he started to arch his back and throw himself backwards I knew it was time to step outside into the narthex. And that's when I smelled the cookies. There was a bake sale going on in the narthex (which in our parish pretty much doubles as the cry room). Awesome, I thought, as my stomach reminded me that dinner was at 5:30 last night and that now, 16 hours later, I'd nursed a particular baby some 7 times but had somehow forgotten to feed myself in the bustle of getting everyone ready for Mass. Whatever. I could offer that up. I stood in front of the glass doors, held Sadie's hand and jiggled Patrick while trying to convince him to take a nap. Then I heard it. The roar of voices. I glanced over. There were a half dozen 8-12 year olds in front of the bake sale table. They were jumping. They were talking in normal excited kid voices. They were throwing cardboard boxes through the air and dodging them. Are you kidding me right now? I thought to myself. During Mass? In the narthex? With at least a half dozen people out there trying to focus on Mass? I stood in front of the doors and tried to hear the words over the din. I glanced back and realized that the kids weren't alone. There was actually a woman there with them, sitting there, watching them run wild. I focused again on the Mass. And then Patrick made a little tiny fussing sound and without even realizing what I was doing I let out the loudest "shhhhhhhhhhhhhhhhhhhh" that has ever passed my lips. And the narthex fell silent. A shocked silence. An eyes boring into the back of my head silence. For about two minutes. And then the roar returned. I moved over to another door and tried to mentally block out the sound so I could hear the priest speaking. No such luck. But then movement in the glass caught my eye. Mrs. Adult Supervision (I was going to try to shorten that down to an acronym but realized that's not going to work...) had gotten up and followed me and was standing behind me watching me. Because I'm the problem here, right? Not the kids throwing boxes and running around during Mass (by the way, they weren't even there for the bake sale. They were apparently there to hand out fliers). Not the kids that were now even less supervised (there was a huge crash and I managed not to look over to see what had happened). And that's why I went outside. Before my head exploded from the noise and the banging and the eyes staring into the back of my skull and the not being able to hear the priest. You're here for the Eucharist, I told myself as I paced and jiggled a fussy Patrick. You don't need to hear the priest. Just go back in there. Stiff upper lip. I did and saw the lady standing behind Paul staring about a foot to his right (not many people will glare directly at him for some reason...). I went behind her, sat down in the stairwell and nursed Patrick hidden in his carrier until he was finally asleep (somehow nursing him, even in his carrier, in front of a large group of misbehaving preteen boys just didn't sound like a ton of fun). Then we finally made it back to the pew for the remainder of Mass, which was a welcome relief, even with the electric guitar. I don't know if I can say anything beyond, we survived but... we survived. A) Maggie wants to hold my hand but not with her right hand since she's holding a toy rake and doesn't want to put it in her other hand. B) Sadie's about to cry because, as a result of the rake, I'm holding Mae's left hand and she "doesn't want to stand next to Maggie right now." C) I make a threat about the loss of beans in the bean jar if everyone doesn't smile right now. By the way, threats don't usually create good pictures, now matter how much you wish they did. D) Yup. This is pretty much as good as it's going to get. The girls are both in dresses made by Nani. Patrick's in a thrifted outfit. And I'll tell you what Sadie has on her head in a few paragraphs. I was having trouble getting a full length picture with the lighting in my room this morning (if I went back any further the color was totally washed out on the computer). 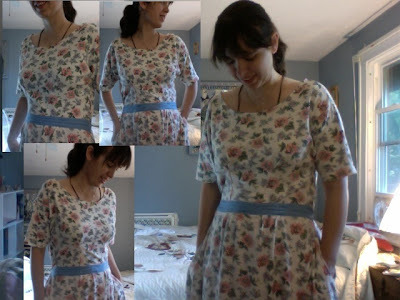 I made this dress on Friday night after I finished my work sewing. I took a dress that my mom wore back in the nineties and had passed on to me a while back. I always loved the fabric. I cut out the t-shirt style neckline and the elastic waist, put in darts, a waist band and a tie, hemmed it and changed the shape of the arms. It's one of my new favorites I think. Especially since it's also pretty comfortable! And then? Tears. She insisted she loved it. She wanted to wear it. Finally the cause of the tears were uncovered. She didn't like the contrasting lining (which matches her dress). 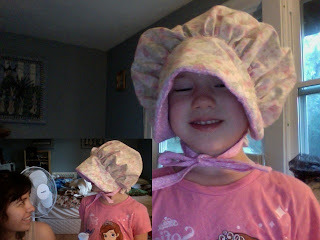 Apparently contrasting lining shouldn't be part of a "prairie girl bonnet." Sigh. I assured her she did in fact look like a prairie girl and she enthusiastically wore it to Mass this morning (of course). Paul's comment when asked if he heard my "shhhhhhh" sound: "Yes I did. And I thought: Well. She's finally snapped." Wow, we have had 2 electric guitars join the mass I have been to and they forced me to leave before the closing hymn was finished today. Our beautiful church is a shrine to the Blessed Mother and just this past Thursday was designated a Basilica. It's gorgeous Spanish brick design and the acoustics work well with organ, piano and even acoustic guitars but the electric guitars...and they don't play the melody of the hymns and drown out the piano and the choir. So, the congregation is slowly stopping singing. I am really trying to be charitable about this, I am. It helps to know I'm not alone in my frustration and this isn't just my parish! Wow! Sounds incredibly stressful. I would have been hard pressed to not just leave and come back for a later Mass. God bless you for doing everything possible to remain charitable and avoid that pesky near occasion of sin! Is it possible to mention something to the pastor about the incredible distractions in the narthex. Maybe he could say something during the homily or announcements. Or better yet, like they do at my parish, have one or two ushers stationed in the narthex during Mass, maintaining a reasonable amount of peace. And I love your dress. It's beautiful! You are such a talented seamstress. 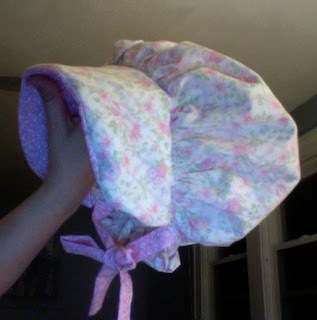 And, my girls used to have prarie girl bonnets..they loved them! Mass should be a place where one feels frustrated, belittled, and just plain uninspired. Sorry about your experience this morning! I, too, hate bad music. One of the reasons we now attend the TLM. Ugh, I'm so sorry! I was getting frustrated just reading your post; I can't imagine how I would have reacted if I was actually there! I like the previous poster's idea of saying something to the priest about the ridiculous amount of noise and activity in the narthex. I really don't think there's any excuse for that. Oh my word! That sounds so horrendously frustrating. Well done for (just about) managing it. We had an interesting sermon lately about sung worship and remembering that the songs (whatever form they take) aren't for us - they're for God. And we don't have to like or enjoy them to meet with God through them or remind ourselves of His character. But we do bear responsibility for demonstrating a right attitude towards songs or musical worship we don't enjoy. Perhaps it's from having worked much too long in retail, but I cannot stand badly-behaved children. About the only thing lower on my personal list than badly-behaved children are the adults who teach them to behave badly by letting them get away with it. Don't get me wrong: a baby like Patrick can't be expected to be totally silent through the entire Mass, and toddlers will wriggle and make some noise. That's perfectly normal, and if you attend a Catholic Church you should expect, I hope, to see lots of babies and toddlers and be willing to put up with the occasional noise from that set. Actually, at Mass today I was bracketed by one family with a baby and a toddler and another with two kids about 4 and 5 years old. Perfectly behaved they were definitely not, but their parents were clearly making an effort to teach them how to behave, so I didn't mind the noise a bit. Yes, I would definitely say something to the priest. That is just plain obnoxious. And I liked the implied "intimidation" by the woman who was supposedly watching those little monsters...GAH! I will refrain from commenting on the subject of electric guitars at Mass lest I have to go to Confession. Oh, I would have said something to the group of kids. I did, in fact, say something to a couple of older people in the narthex (which has speakers for people to be able to still hear the Mass) during 8 am weekday Mass one day - they were chatting as if I wasn't there and Mass wasn't going on. I would say 100% of the time, they don't realize the problem, so it's perfectly fine to let them know you're trying to participate in the Mass and could they please move somewhere else to continue their conversation. No biggie. Good for you for expressing your opinion of the situation ! As someone raised in the Episcopal Church (and I am not criticizing Catholic tradition, just commenting on the contrast), I'm used to babies being in a "crib room" staffed by volunteer moms and toddlers in a pre-school program (also run by mothers) and not being in church during the service. School-aged children were in church until the sermon and then dismissed for Sunday School. Even the pre-schoolers had a religious program/service, after playtime in a separate room. Again, not criticizing, but yours is a tradition I didn't know about until I read this blog. 1) I'm sorry you had a rough time at Mass. That would drive me crazy too. If we want our kids to respect the Mass, Church, and Faith, then we need to make sure that by the time our kids are older, they have been taught that respect! I probably would have lost it. 2) I love that dress! 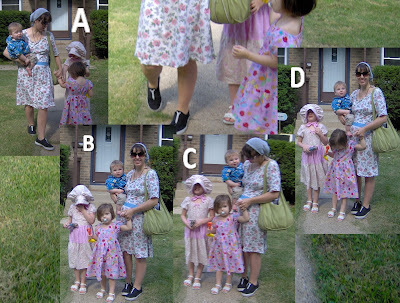 3) Sorry if this is too personal, but how do you nurse in that dress? I love dresses with the high neck and sleeves but I had to give them up because i can't nurse in them. Did you make that with like a hidden panel or is it really a skirt and top combination cleverly disguised? Totally not too personal (and you're not the first person to ask!). The fabric is really stretchy so I can just pull it down to nurse. The result is that a cover/carrier that covers is needed when we're out and about, but it's stretchy enough to be workable!